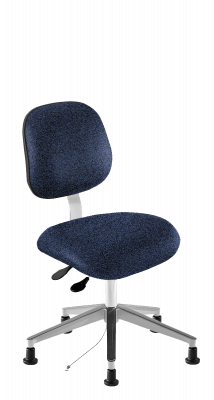 The Avenue (AE) Series features saddle-shaped seats and ergonomic backrests to promote user comfort and higher productivity. This versatile seating can meet clean room and static control demands. Its functional design allows use in a range of education, healthcare, laboratory, industrial and offce settings. Options are available to meet a variety of needs and budget requirements. 13-year warranty. Cloth and vinyl upholstery styles available to match various workspace requirements. Saddle-shaped, contoured seat with waterfall front and internal seat board bumperguard. Meets CAL 117 fre retardant standards. Treatment to meet CAL TB 133 available as an option. Dual-wheel non-marring polyurethane casters resist movement when the chair is unoccupied, enhancing safety by inhibiting seating from rolling away.